Walking Into Holy Week Beloved Friends, We are getting ready to turn the corner and move from Lent into Holy Week as we gather this Sunday. We will soon begin our final week with Jesus marking the final days he traveled with us here on earth. 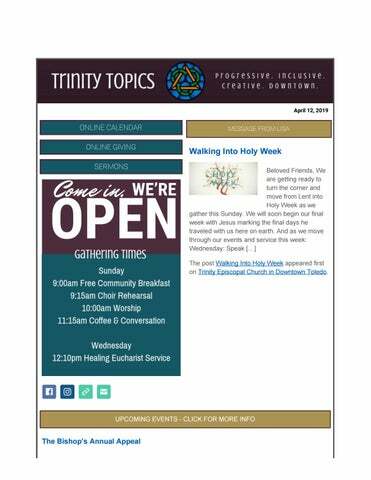 And as we move through our events and service this week: Wednesday: Speak […] The post Walking Into Holy Week appeared first on Trinity Episcopal Church in Downtown Toledo. The Bishop’s Annual Appeal allows us to live more fully into our vocation as the body of Christ. Last year the Appeal raised just over $300,000, thanks to the generosity of households like yours. $100,000 of that went directly to Episcopal Community Services to support outreach ministries that feed the hungry, educate children and young […] The post The Bishop’s Annual Appeal appeared first on Trinity Episcopal Church in Downtown Toledo. Men’s Bible Study Saturday April 13th, 9:00am Join us for a monthly men’s Bible study. We meet on the second Saturday of each month at 9:00am at Rick’s City Diner, 5333 Monroe St. in west Toledo (near the corner of Monroe St. and Nantuckett Dr.). Our discussion starts with the gospel reading appointed for the next day. 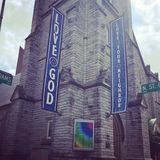 This […] The post Men’s Bible Study appeared first on Trinity Episcopal Church in Downtown Toledo. Palm/Passion Sunday Sunday, April 14, 10am Palm Sunday, the first day of Holy Week, has become the day when, following a procession into the worship space, the whole Passion story is read out loud, but that was not always the case. It used to be people gathered to lift their palm branches and shout Hosanna! as we […] The post Palm/Passion Sunday appeared first on Trinity Episcopal Church in Downtown Toledo. Speak Truth to Power – Staged Reading Wednesday April 17, 7:00pm Speak Truth to Power: Voices from Beyond the Dark is part of Trinity’s Holy Week Observance this year and is presented with support from Actors Collaborative Toledo. Trinity Episcopal Church and Actors Collaborative Toledo will present a staged reading of the play by Ariel Dorfman, based on the book by Kerry Kennedy […] The post Speak Truth to Power – Staged Reading appeared first on Trinity Episcopal Church in Downtown Toledo. Maundy Thursday Thursday, April 18, 6:00pm-8:00pm This evening we gather to share an outrageously delicious Mediterranean meal, as we remember how Jesus gathered with those closest to him for a final meal. During this meal he spoke of his love and knelt before each of them to wash their feet and say goodbye; we will do the […] The post Maundy Thursday appeared first on Trinity Episcopal Church in Downtown Toledo. Vigil Reading at the Tomb Thursday, April 18, 9:00pm until Saturday, 5:00pm. Click Here to signup for one or more reading slots. Following the Maundy Thursday Service, we will begin our Vigil Reading at the Tomb. This is a time to sink into the beauty and depth of our tradition as we prepare for Easter. Individuals sign up to read alone […] The post Vigil Reading at the Tomb appeared first on Trinity Episcopal Church in Downtown Toledo. Good Friday – Stations of the Cross Friday April 19th, 12pm & 7pm At both services (12:00noon and 7:00pm) we will move through the worship space stopping at each of the 9 “stations.” At each station we remember different moments along the lonely road to Golgotha as Jesus carried his cross to his crucifixion. This is both a somber and sacred time […] The post Good Friday – Stations of the Cross appeared first on Trinity Episcopal Church in Downtown Toledo. Easter Sunday Sunday April 21st, 2019 10am Christians all over the world celebrate Easter as our primary festival each year. Whether you come to church this day out of habit or faithfulness, invitation or tradition, it is a day when the community gathered embraces the power and possibilities of the words we hear, the songs we sing […] The post Easter Sunday appeared first on Trinity Episcopal Church in Downtown Toledo. Easter Memorial Flowers Order you Easter memorial flowers today! Recommended donation of $15.00. Order forms are at the Welcome Station in the Sanctuary; please return by Wednesday, April 17th. Please send questions to admin@trinitytoledo.org. Next to New Update Bring on Spring! Next To New hosted its Spring switch-over on April 6 with the help of over a dozen student volunteers from Toledo Technology Academy, led by our very own Taylor Tennant. A special thank you to TTA! Sale of the Week 50-75% off all Easter merchandise! NTN will also be hosting an Easter Egg Coupon Hunt April 15th and 18th! Closed on Easter Monday Next To New will be closed on Monday, April 22 in observance of Easter Monday. We will reopen on Thursday, April 25th at 9:30am. New Logo for Next To New Votes are in...Next To New has a new logo! You can check it out on the Trinity Membership program buttons available in the shop! Stop by to get your button and begin earning great savings towards our merchandise! reclusive reading habits and his love for the theatre and the arts, yet who did not live to witness his […] The post Performing Artist Series: For The Pleasure of Seeing Her Again appeared first on Trinity Episcopal Church in Downtown Toledo. New Music and a Mixer Trinity Episcopal Church Singer/Songwriter Event Friday, May 17th 7:009:00pm Calling all songwriters/musicians! Trinity will host its first Singer/Songwriter competition and is seeking submissions from all ages and musical genres. Submissions may be sent to nate@trinitytoledo.org until the deadline of April 15th. Submissions may be in either video or audio files and include: name of artist, best contact information […] The post New Music and a Mixer appeared first on Trinity Episcopal Church in Downtown Toledo. For children who have completed grades K-12 We are also seeking camp counselors. If you or someone you know may be interested, please fill out the application online. Maryland partnership blends Episcopal-Lutheran congregations while upholding both traditions 04/11/2019 16:03 [Episcopal News Service] Communion at 901 Courtney Road in Arbutus, Maryland, looks a bit different from Communion at most Episcopal congregations. Worshippers choose between wine and grape juice, with the […] The post Maryland partnership blends Episcopal-Lutheran congregations while upholding both traditions appeared first on Episcopal News Service. La Diócesis de Northern California anunció el exitoso proceso de consentimiento canónico 04/11/2019 11:58 [Episcopal Church Office of Public Affairs] La Diócesis Episcopal de Northern California recibió una notificación del Obispo Presidente y Primado Michael B. Curry y del registrador de la Convención General, […] The post La Diócesis de Northern California anunció el exitoso proceso de consentimiento canónico appeared first on Episcopal News Service. Heidi J. Kim, Episcopal Church staff officer for racial reconciliation, accepts position with the Breck School in Minnesota 04/10/2019 15:35 The post Heidi J. Kim, Episcopal Church staff officer for racial reconciliation, accepts position with the Breck School in Minnesota appeared first on Episcopal News Service. Episcopal groups plan gun violence ‘action’ weekend in Colorado 20 years after Columbine 04/09/2019 16:04 [Episcopal News Service] The Episcopal Peace Fellowship, in collaboration with Bishops United Against Gun Violence and more than a dozen other groups, is planning a series of anti-gun violence events […] The post Episcopal groups plan gun violence ‘action’ weekend in Colorado 20 years after Columbine appeared first on Episcopal News Service. [Anglican Communion News Service] Political and Christian leaders from South Sudan will gather in the Vatican this week for an unprecedented spiritual retreat led by Archbishop of Canterbury Justin Welby […] The post Pope Francis and Archbishop of Canterbury to lead spiritual retreat for South Sudan’s leaders appeared first on Episcopal News Service.